Among M. Night Shyamalan’s list of most-hated films, you’ll most definitely run into two specific ones – The Happening and The Last Airbender. It’s just a fact, people absolutely hate these movies. The Happening is a film that I sort of understand why…but not so much for the latter. The Last Airbender is not the best movie in the world, no, but it is far, far from the worst. The only thing I can think of is that people didn’t like it because of the way the story is presented in the original animated series versus the film. We’ll get to that, but here’s a spoiler – I never watched the series – and apparently that works out for the better in my case. Okay, so Aang is a special little kid. 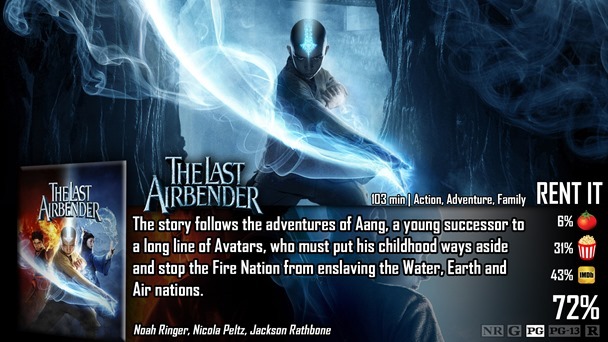 In a fictitious world of people that have the ability to bend the four basic elements, Aang is the last one alive that can bend the element of air. He’s also the legendary Avatar, who is basically Neo in the Matrix. Supposedly, he has the potential of commanding all four elements, but at his young age, can only control air. So the evil Fire Nation are trying to imprison him in order to stop his learning. Alrighty, so why do people hate this movie? It’s clear to me, even by Rotten Tomatoes basic overview consensus, that people didn’t like the film because it botched up the original source material. As I’ve said before, I didn’t see the original source material, however…I also believe in creative freedom if it is done in a good light. If their interpretation of the story makes sense and is fun to watch all on its own, then that’s all that matters. Screw the cartoon, watch THAT if you want to see that interpretation. This film is absolutely fine. It makes sense, there is a clear goal, and there is some really fancy visual effects going on throughout the film – as well as interesting fight choreography. I liked the film just fine, but it does have one huge flaw, and that is unfortunately the acting. Critics got it spot on here, because the acting is mediocre at best, and the Avatar himself is the absolute worst actor of the bunch. I love what he’s about and the actions his character does on screen, he’s got the look, but the acting is pretty bad I have to admit – which does take the movie down a notch. That’s the thing though, people make this movie out to be absolutely atrocious when the only bad thing about it is the acting. The rest of it is fine. It’s not confusing, it doesn’t have “incomprehensible plotting” (RT). It’s about a kid on a quest to reach his potential – and you as the audience knows the obstacles he must go through in order to reach that potential. It’s an action adventure kid’s movie…I really don’t get what everyone’s deal is. For what it’s worth, it did what it intended to do for it’s specific target audience. In the end, what more can you ask for? People really gave this film crap when it didn’t deserve crap. No, it doesn’t stay true to it’s source material (or so I’ve heard), but who gives a crap? As a movie on its own, it’s an action adventure kid’s movie about a boy on a quest to reach his potential, and the people in the world that are willing to risk their lives in order to stop that from happening because they feel threatened. How exactly is that bad? I’m not even going to mention the source material here, because that makes no difference as to a movie being good independently. If you require the movie to stay true to the original source, you are a closed-minded audience member. Instead, the one and only bad thing about this movie was the acting. 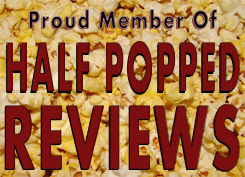 The acting dropped it down a few notches because it was pretty bad here and there. But again…kid’s movie.